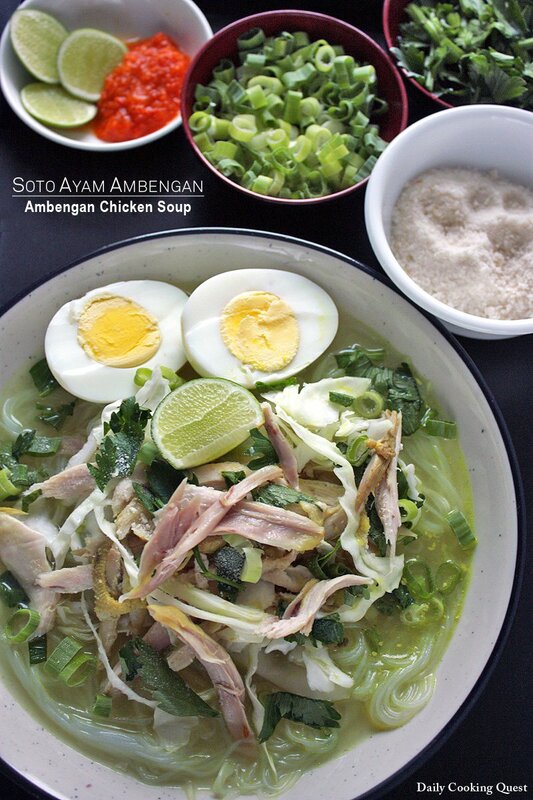 The make up of a soto ayam Ambengan. 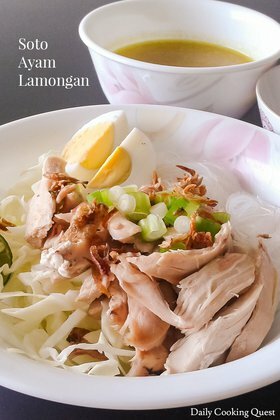 Boil together chicken, water, lemongrass, and kaffir lime leaves. Meanwhile, heat the oil in a frying pan, and sauté spice paste until fragrant. Transfer the cooked spices into the chicken soup. Season the soup with salt and sugar, and keep cooking until the chicken is thoroughly cooked. 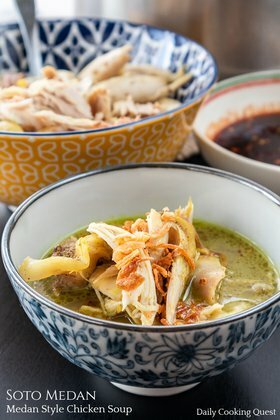 Turn off the heat, remove the chicken from the soup, remove the bones and tear the meat into small shreds with your hands. Set the chicken meat aside. 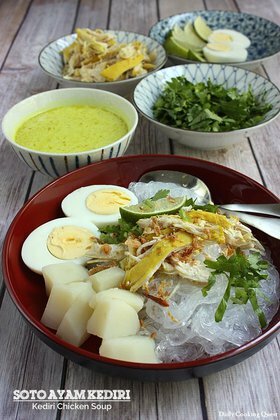 Soak the glass noodle in cold water until soften, then blanch in boiling water until fully transparent. Refresh under cold water, drain, and set aside. Thinly slice the cabbage to make cabbage shreds, then blanch in boiling water. 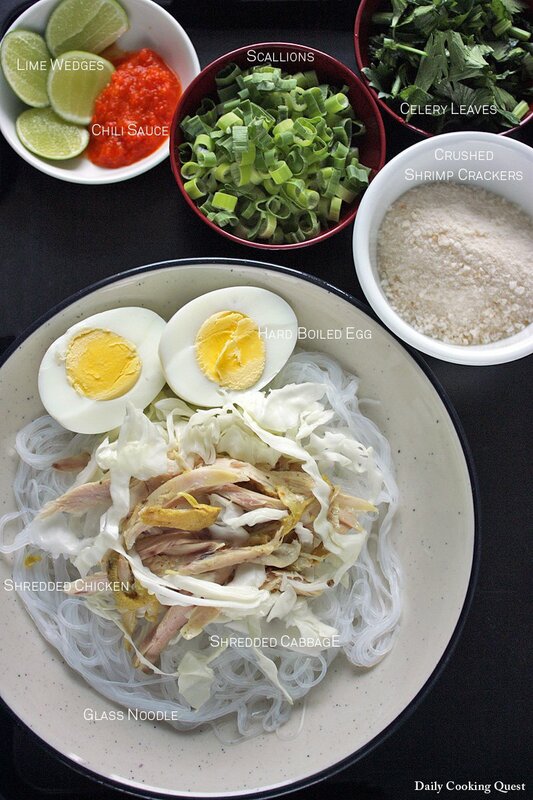 Arrange boiled glass noodle, cabbage, chicken meat, and egg in a serving bowl. Top with some soup and some koya. Garnish with sliced scallion and Chinese celery. 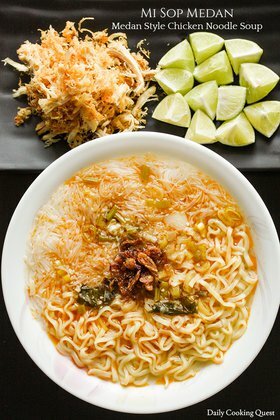 Serve with boiled chili sauce and lime wedges. Lovely, my mom specifically using the male malay chicken for the broth... quite and effort for gathering party, but i guess it's all worthed then! I just made this for my Indonesian fiance. He said it tasted just like his Mums and it was the first time I cooked it! Is there any other better compliment?